Ranger Naturalist Steve Diers was honored last month at the California Trails and Greenways Conference with a Lifetime Professional Achievement Award. In 1990, Steve began his career at the District with the Camanche ranger unit. Previously he worked with the East Bay Regional Park District (EBRPD) for 14 years where he led equestrian tours and managed trail crews and volunteers. 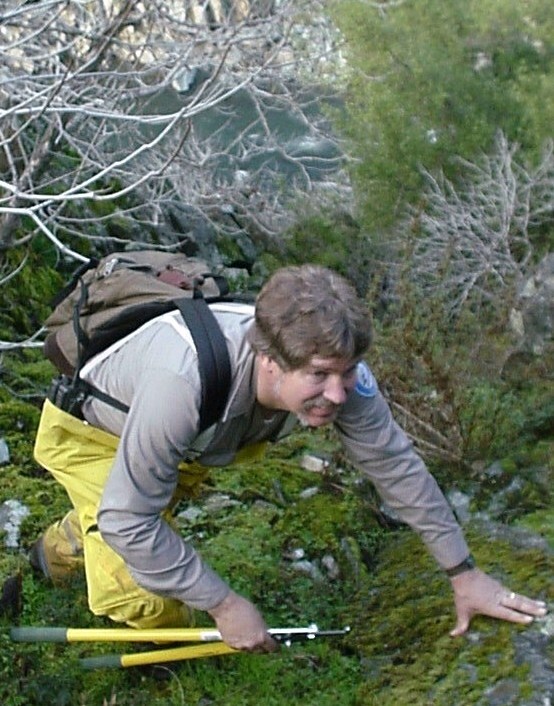 Two years after starting at the District, Steve launched EBMUD’s award-winning Mokelumne Trailbuster volunteer program in the Pardee and Camanche watersheds. He has worked with volunteers every other Saturday to build a 32-mile segment of the Mokelumne Coast-to-Crest Trail along EBMUD property. He and the Trailbusters have completed 28 miles so far. Photo text: Naturalist Steve Diers leads a group hike. More than 24 years in the making, the Coast-to-Crest Trail is envisioned as 300 miles of continuous trail that begins on the shores of San Francisco Bay and heads east to Ebbetts Pass in the Sierra. At various points it crosses EBMUD and EBPRD lands. Some sections of the trail are so rugged and remote, California Conservation Corps members had to camp nearby and hike in with Steve every day hauling tools and supplies. “My goal is to finish the easternmost segment between Middle Bar and Highway 49 before retiring next year,” he says. Throughout his career Steve says he’s seen 13 mountain lions while on the job. “This job is like working in a bakery or a candy store. Everywhere there are natural, cultural and historic features you just can’t get enough of! There’s the canal cave with the Native American pictographs; the Wildermuth home, a historic stone house built in 1861; and a portion of the trail between James Bar and Patty’s Point that is famous for the wildflowers,” he says. Steve says to be a successful ranger you need to have stamina, be a jack-of-all-trades, be self-motivated and be able to work alone in remote locations. “You have to be committed, interested in nature and want to share the information you have about the outdoors with the public,” he says. “I do enjoy my job, but I also believe it’s important if you are spending 40 hours a week on a job, you feel you are making a difference. Photo text: Steve says to be a successful ranger you need stamina and commitment. He is the tenth recipient of the California Trails and Greenways Conference’s Lifetime Achievement Award. For me that has been working on the Coast-to-Crest Trail, conducting the tours, reaching out to the communities where we live and work, and recruiting volunteers” he says. He adds, “I work with great people with myriad skills and abilities. There’s a great sense of collaboration and humor in this division.” He says that everyone in the division gets involved in the trails and volunteer program in some capacity. Steve and his wife Stephanie live in Glencoe, a town located 22 miles from Pardee Dam.